The GMC Sierra is almost exactly the same product at almost exactly the same price, but you might consider it instead of the Chevy because of GMC dealerships’ typically higher customer satisfaction ratings. The 2008 Chevrolet Silverado has moved upmarket without forgetting about its work-truck roots. TheCarConnection.com scanned a wide range of available reviews on the new Chevrolet Silverado to pull together this conclusive review. In addition, TheCarConnection.com drove the Silverado to give an expert opinion and help find the best information and advice on how it matches up to the competition. The Silverado is Chevrolet’s full-size, light-duty pickup truck. It was completely redesigned for 2007, and changes for 2008 are relatively minor. 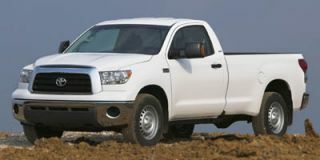 Like most of the other full-size pickup models, such as the Ford F-150, Dodge Ram, and Toyota Tundra, the Silverado is available in a wide range of models—including three different cab styles, and two different interior designs—to suit the needs of everyone from contractors and farmers to style-conscious commuters who need towing or hauling ability for the weekend. The engine range goes the distance to an all-aluminum, 6.0-liter V-8 cranking out 367 horsepower, though the popular 315-hp, 5.3-liter V-8 will offer enough power for most needs and comes with Active Fuel Management to help improve fuel economy. While the Silverado’s engines are fully competitive, its line of four-speed automatics is a bit behind the five- and six-speed competition. But for many shoppers, its steering and handling are at the top of the pack and help make the big truck feel less cumbersome on real streets. Features are also a Silverado strong point; it can be optioned up with nearly everything that might be available in a luxury SUV. GM doesn’t stray much from its safe zone in styling, but offering two different interiors should be enough to satisfy everyone. The Silverado was completely redesigned for 2007, and while the back end of the truck looks very familiar, the front end sports a completely new look. It shares elements—including the steeper windshield—with the full-size Tahoe SUV, but this time the Silverado takes a slightly different tack in front, including “vertically-stacked headlamp elements, heavily flared front fenders, and the largest Bowtie badge that we’ve ever seen on a Chevrolet,” according to Autoblog. Four Wheeler noted that the Silverado’s styling is now significantly different than that of its mechanically identical sibling, the GMC Sierra, with different front ends, headlamps, and taillights along with different bedsides and box designs. “To our eye, the GMC looks stockier and brawnier than in the past, the Chevy perhaps a bit sleeker and aerodynamic,” Four Wheeler said. Inside, the new design is more radical—for a pickup. The Silverado offers two different interiors: a luxurious one on the LTZ, or the work-oriented Pure Pickup setup on the WT or LT. Both interior setups won favor with reviewers. The LTZ’s interior found critical praise for its carlike setup, though some pointed out that those with work gloves on would have to remove them to use some of the controls. Consumer Guide summed up the difference as follows: “The Pure Pickup interior places radio and climate controls high on the dashboard, just out of easy reach. The available luxury interior mimics that of Chevy's Tahoe and Suburban large SUVs, with controls mounted lower but in easy reach." The 2008 Chevrolet Silverado may miss a shift or two, but it steers and handles better than virtually any other pickup, ever. Positive words were flowing for the way that the Silverado steers and handles. Motor Trend had complimented the Silverado’s handling, which “takes a set as flat as any modified tuner truck we've driven.” MT continued to heap on the praise for the truck, which “the smoothest road feel and most confident turn-in of any full-size pickup,” while Autoblog said that the Silverado’s “steering and brake feel defies comparison to other half-ton pickups.” In a comparison test versus some of the Silverado’s main competitors, Car and Driver said that the Silverado handled the most confidently, with crisp steering and braking, while delivering a smoother ride than other pickups tested. 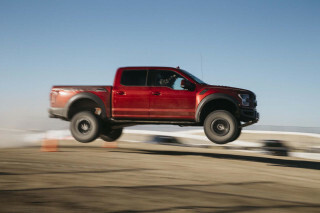 However, Edmunds found the braking performance of their truck, which weighed almost 5,500 pounds unloaded, a bit unimpressive. Autobytel.com also took the Silverado off-roading and said, “On the plus side, the steering wheel stays steady and straight even when inching over uneven boulders or ruts.” While off-roading, they noted trouble seeing over the large hood, especially when cresting large hills. “On more than one occasion, we were forced to stick our heads out for guidance,” they said. ConsumerGuide also noted that the Silverado with the 5.3-liter engine was among the most frugal in its class. The engine’s Active Fuel Management system can shut off four cylinders to save up to 20 percent in fuel. 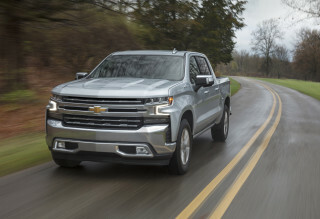 In an around-town drive in a lightly optioned Silverado LT with the 5.3-liter engine, TheCarConnection.com was wowed by higher standards of refinement than we’ve come to expect in a pickup. The Silverado clearly wasn’t a standout in acceleration or braking, but it steered and handled more crisply than we’ve come to expect, easing a white-knuckle affair on narrow city streets. The 2008 Chevrolet Silverado’s materials and build quality are good, but they don’t quite do justice to the excellent new interior designs. Ride quality tends to be a sore point with pickups, but the Silverado passed this test with flying colors according to most reviewers. The Silverado also comes with several suspension calibrations; ConsumerGuide tested the passenger-oriented Z85 suspension and found it “compliant and fairly comfortable, with less reverberation over bumps than in most pickups,” while the Z60 and off-road-oriented Z71 calibrations were stiffer and harder-riding. Seating comfort was a subject of controversy, leading us to believe that the Silverado’s seats cater well to some body types and not to others. ConsumerGuide, concerning the Crew Cab body style, said, “With front bucket seats, the center console restricts toe space for the center rear-seat passenger.” Headroom and legroom were generous, they commented. Autobytel.com said that there was plentiful head, leg, and shoulder room. They found the LTZ’s front seats large and well padded, aided by padded doorsills and armrests, and said that they remained supportive after several hours of driving. Autobytel.com also found entry and exit a little hard in their Crew Cab test truck due to the lack of running board but applauded the wide-opening doors. But Autoblog was clearly not a fan of the seats in their LTZ, saying that larger drivers might find the interior tight due to the center console design and low dash; the seats themselves, they said, “...felt more like an overstuffed arm chair than a proper automotive seating surface.” They weren’t the only one to complain; Car and Driver made mention that headroom was tight for a 6’6” driver. This reviewer is a pickup driver only when he has something big and/or messy to haul. But in a firsthand driving experience with a Silverado, TheCarConnection.com should say that pickups are built to haul heavy loads and their suspensions do so somewhat to the detriment of ride quality. That applies to the Silverado, but we found the level of seating comfort and the apparent quality of the materials inside to be pretty impressive, and its interior would be one of our top choices for long-haul duty. The 2008 Chevrolet Silverado provides the protection but lacks some of the standard features that are fast becoming expected by shoppers. The Silverado now has standard StabiliTrak electronic stability control—a feature that can make a very significant difference in avoiding accidents, especially for pickups. 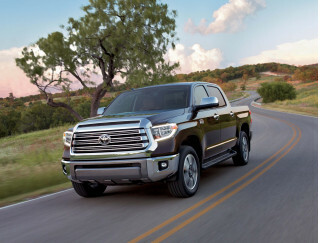 But even on top-trim models head-protecting side curtain airbags are optional and side airbags aren’t available; one of its chief competitors, the Tundra, has standard seat-mounted side airbags and side curtain bags across the line. That said, the Silverado 1500 achieved straight five-star ratings—the top possible—in federal crash tests for frontal and side impacts, along with top Good ratings in the insurance industry’s frontal offset and side crash tests. But in the IIHS rear protection tests, the Silverado got an overall rating of Acceptable. 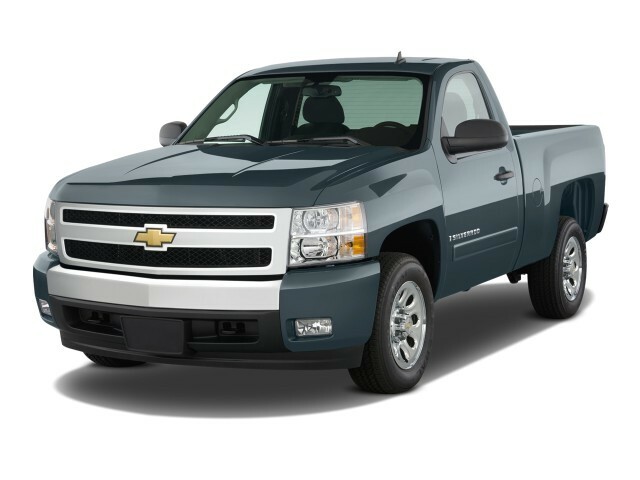 In top-of-the-line LTZ trim, the 2008 Chevrolet Silverado really piles on the luxury and convenience extras but lacks the especially innovative storage features that would make it the obvious winner. Most reviews were of the top-of-the-line LTZ model, which offers—in addition to the softer-design, more carlike interior—many features not always seen among full-size pickups, such as remote engine start, a touch-screen navigation system, a fold-down rear entertainment system, power-adjustable pedals, and power-adjustable leather seats. Options include a power sliding rear window, big 20-inch alloy wheels, and a rear parking assist system. Car and Driver also noted that the Silverado’s storage spaces lacked organizing dividers and weren’t as innovative as those of competitors. (The work-oriented Pure Pickup interior has separate upper and lower glove boxes, while the luxury version featured in the LTZ only has the lower one.) They, along with several other reviewers, criticized the lack of a liner. Kind words were otherwise said about the cargo area. 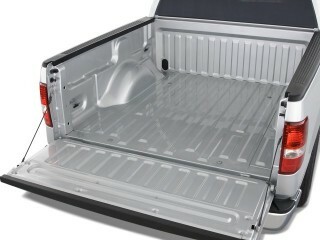 Jalopnik called the flat loading floor “one of the coolest features on the truck.” Autoblog also noted the deeper cargo box, along with the load-assist torsion bars in the tailgate, allowing it to be closed with one arm.